Archive a team when it’s no longer active, but you want to keep it around for reference or to reactivate in the future. The conversations and files in the team become read-only once you archive it. You’ll still be able to search through it for stuff you need—you can even keep it as a favorite. Only team owners can archive and restore teams. Select Teams on the left to see the list of your teams. At the bottom of the list, select Manage . 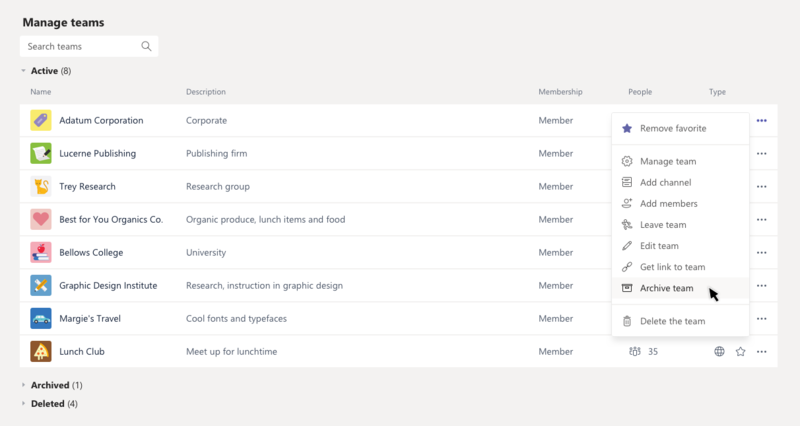 In the Active list, find the name of the team you want to archive, then select More options > Archive team. To view and search through the content of the archived team, click its name in the Archived list. Or, make it a favorite if you think you’ll refer to it often (in the list, select the team, then More options > Favorite). All of the team activity is frozen once the team is archived. No one will be able to start new conversations or reply to posts in a channel, add or remove channels, edit team settings, or add apps. 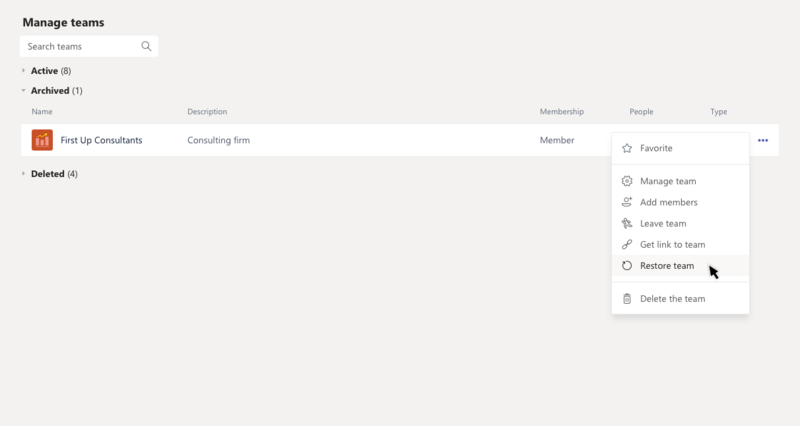 As a team owner, you’ll still be able to add or remove members, update roles, and delete, renew, or restore an archived team. To restore an archived team, follow steps 1 and 2 above. Then, in the Archived list, find the name of the team you want to archive, and select More options > Restore team. For now, go to the Teams desktop app or Teams on the web to archive or restore a team. To view an archived team on your mobile device, first make it a favorite team (again in the Teams desktop app or Teams on the web). It'll then show up in your Favorites list.